A couple of weeks ago Packt Publishing contacted me and gave me a free e-book version of Divya Manian’s new book HTML5 Boilerplate Web Development. For a while now I’ve been wondering who was going to write a book on HTML5 Boilerplate. Although much of what’s in Boilerplate is “plug and play” (i.e., it just works, even if you don’t know what it does), I think many people are intimidated by it and would like a deeper understanding of what’s going on, and what is the optimal way to employ this popular framework. So a book on this topic is a great idea. I don’t normally do book promos of books I haven’t read. But this one is different. Divya is a very smart developer, and I have no problem promoting this book after only having skimmed its contents. I trust it will be useful, and especially will be of use to those wanting to delve into the more indimidating aspects of HTML5 Boilerplate (the server configurations, the optional features, and the build script). Chapter 1, Before We Begin, covers all you need to get set up for your projects to use HTML5 Boilerplate without much effort. We also broadly look at the files that are included as part of this project and how they help you. 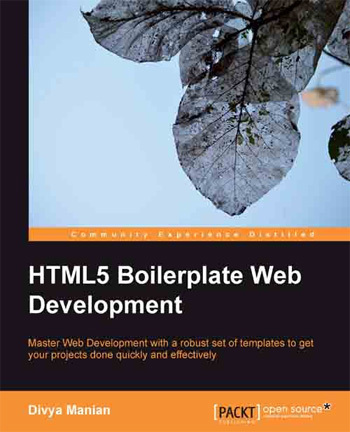 Chapter 2, Starting Your Project, covers how to get started with HTML5 Boilerplate with an example, single page website. In this chapter, we look at the basic essentials of configuring the default setup that works for your project. Chapter 3, Creating Your Site, covers how to customize the styles and the markup of your website along with some tips on how to take advantage of HTML5 Boilerplate’s default style options. Chapter 5, Customizing the Server, looks at how you can ensure that your website gets loaded as quickly as possible by using HTML5 Boilerplate’s custom configurations for the web servers that host your site. Chapter 6, Making Your Site Better, looks at the optional features that can also be used to provide a better experience for the users of your site, which would fit well with HTML5 Boilerplate. Chapter 7, Automate Deployment With the Build Script, helps you to make your sites ready to be deployed live by looking at the Build Script that provides tools to minify CSS, JS, HTML, and images. Appendix, You Are an Expert, Now What? covers some basics of unit testing and provides additional research information on some of the decisions that were arrived at for the features that HTML5 Boilerplate provides. If this looks like something you’re interested in, you can buy the book directly from Packt or on Amazon.